We got over a foot of snow yesterday and it’s very cold out today. Yup, this means I’m in hibernation mode with thoughts of warmer weather and flowers. We haven’t had a bad winter (as far as New England winters go) but I find myself constantly dreaming about things that involve being warmer. Although, being at a beach means I’d have to wear a bathing suit and the thought of that seriously makes me want to work out twice as long tonight. I’m guessing that a full plate of orzo isn’t helping my cause. But let’s be real, I’m not going to the beach any time soon so I have plenty of time to get in shape. Plus, this meal is too dang tasty to pass up. Guys, this sauce is delish. 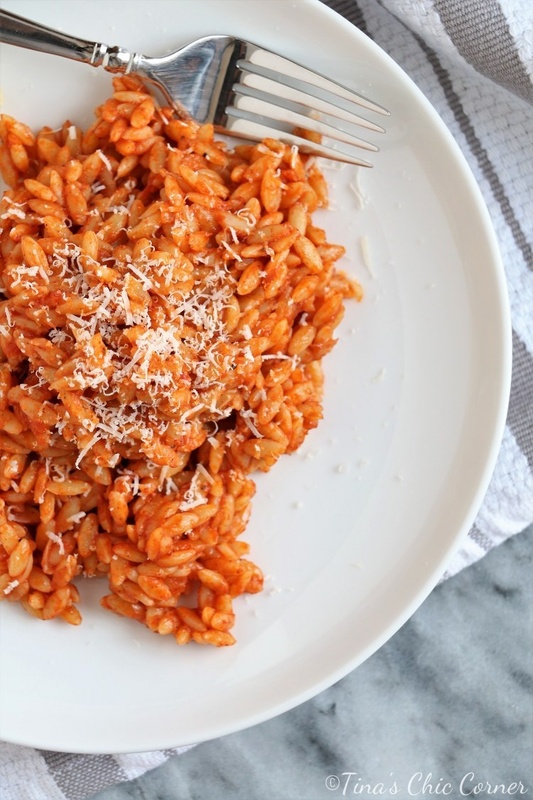 It’s got a lot of warm spices like cinnamon, and there is just enough of it to coat the orzo. 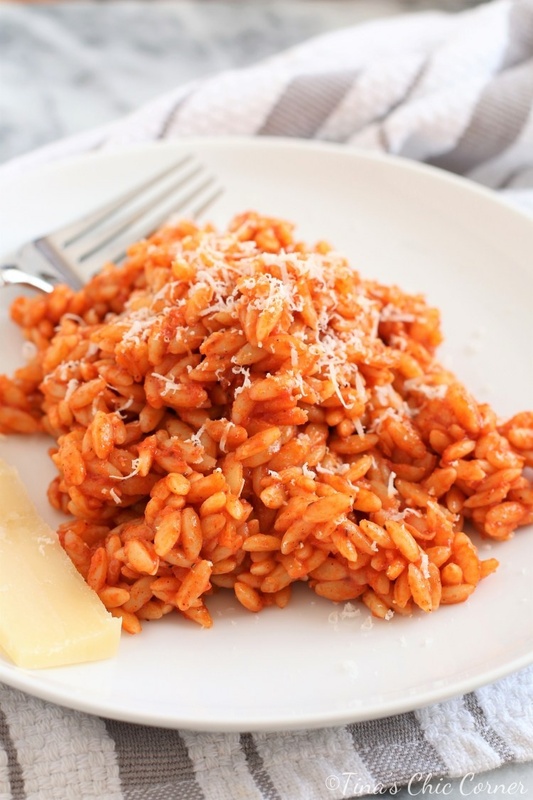 When my husband tasted this orzo he said it is good but likes it better with meat. I can see that. I made a similar version of this sauce with ground meat for my Greek tacos. If you’ve followed me for a while then you know that I’m not always a big meat eater. I wasn’t feeling meat today so I did it up vegetarian style instead. By the way, I would normally add a lot of more cheese. A LOT. But I didn’t want it to look like a dish of snow (there is plenty of that outside, and it would hide the tasty orzo anyway). That extra slice of cheese on the side was definitely consumed after I took these shots. Cook the orzo according to the directions on the box. While the orzo is cooking, prepare the sauce. In a medium skillet, over Medium heat, heat the oil. Add the chopped onion to the skillet and cook until tender. Reduce the heat to Low and add in the minced garlic. Cook for about 30 seconds, or until fragrant. Add the tomato paste, nutmeg, allspice, cinnamon, salt, and pepper and mix everything together. It will be a thick consistency and that’s what you want. Reduce the heat and let it simmer while the orzo is cooking. Drain the orzo, reserving 1/4 cup of the pasta water aside. Add the 1/4 cup of pasta water and the orzo to the skillet and stir until all of the orzo is covered in the delicious sauce. 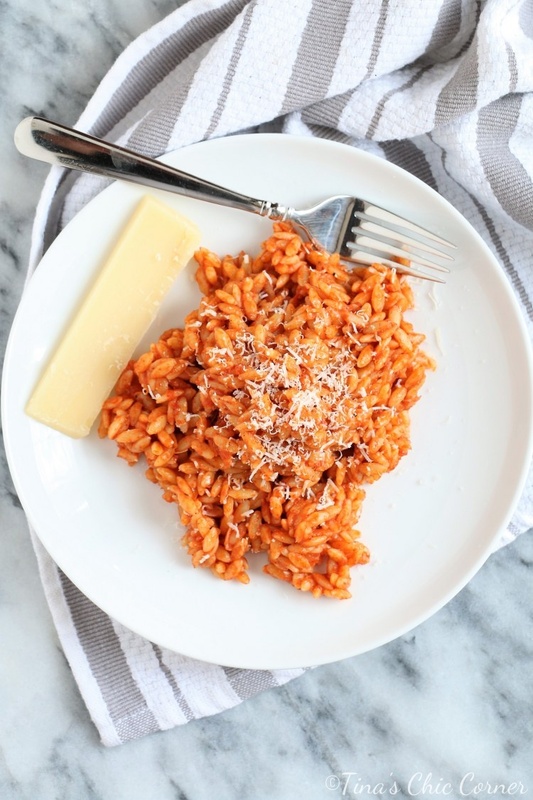 Plate the orzo and sprinkle grated parmesan cheese on top.